Is your scalp itchy and sore? Have you tried plenty of conditioners which seems to either aggravate your problem or have no effect? The good news is that you don’t have to put up with this annoyance anymore! Salcura Omega Rich Conditioner has been especially formulated to treat your scalp with care and tackle the problems head on. 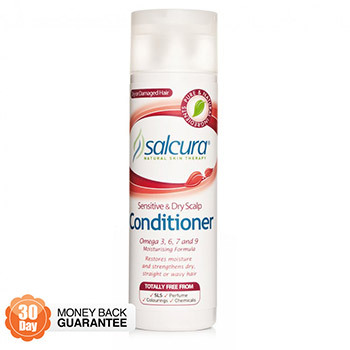 The Salcura conditioner restores the softness and shine to your hair while dealing with the problems associated with a dry, sore scalp. The pure and natural ingredients of Salcura Omega Rich Conditioner ensure your skin is cherished and your hair is moisturised. The paraben-free conditioner is an effective, regular-use conditioner for those suffering with sensitive, dry and itchy scalps. It is the perfect complement to Salcura Shampoo. The conditioner combines a blend of Omega 3, 6, 7 and 9 and plants extracts to leave your hair strong, shiny and your scalp happy. If you suffer from a dry, itchy, sensitive, flaky scalp, scalp psorasis or dry hair, this conditioner could be exactly what you've been looking for. Can be used daily or as required.